The Northern New Jersey housing market slowed a bit in the first quarter of 2019, with sales down and prices flat. But we believe that the market is still poised for sales growth and price appreciation in what will be a relatively robust spring market. Regional sales were down, but the results varied by county. Regional single-family sales fell about 4% for the quarter, but that cumulative number masked a real divergence in the county results. For example, sales were down in Hudson, Passaic, Morris, and Sussex, but up in Bergen and Essex. The most significant slowdown was in Hudson, where overall sales fell almost 15% from last year’s first quarter, probably due to the sharp downturn in the neighboring Manhattan market. Similarly, prices were up a tick regionally, but results were much stronger in lower-priced markets. For the region, the average price was up about 0.5% for the quarter, below the yearlong appreciation of 2.2%. But, again, those cumulative regional results do not really tell the story, since price appreciation varied dramatically by county. For the quarter, the average price fell in all the higher-priced markets—Hudson, Bergen, Morris, and Essex– but rose in the lower-priced counties– Passaic and Sussex. (The results were a little stronger if we look at the rolling year, where every market but Essex saw at least modest price appreciation). Essentially, we are seeing a “tale of two markets,” with price appreciation higher in lower-priced markets and property types. We believe this divergence has been caused by the 2018 Tax Reform’s cap on state and local tax deductions (“SALT Cap”). When the tax code implemented Tax Reform, we speculated that the SALT Cap might have a more significant impact on higher-end markets. Why? Because taxpayers in those markets are more likely to itemize their taxes and thereby feel the pinch of the $10,000 SALT Cap. But in the lower-priced markets, homeowners and buyers are more likely to be at income levels where they tend to take the standard deduction, meaning that the SALT Cap would have little effect on them. Essentially, the SALT Cap is suppressing sales and price appreciation in the higher-priced markets like Hudson, Bergen, Morris, and Essex, but having little or no impact on lower-priced markets like Passaic and Sussex. Indeed, we are seeing the same thing throughout the metropolitan region – in the northern suburbs of New York City, for example, prices were down in higher-priced Westchester but up in lower-priced markets like Rockland and Orange. The SALT Cap is not devastating these high-end markets – for example, the rolling year average price in the higher-end counties was still up – but it is hampering what would otherwise be a fairly robust seller’s market. Going forward, we still believe that the market is poised for growth. At some point, we expect the impact of the SALT Cap to get priced into the market, because the seller market fundamentals are otherwise very strong: the economy is growing, interest rates are near historic lows, inventory is relatively low, and homes are still priced well below their highs. 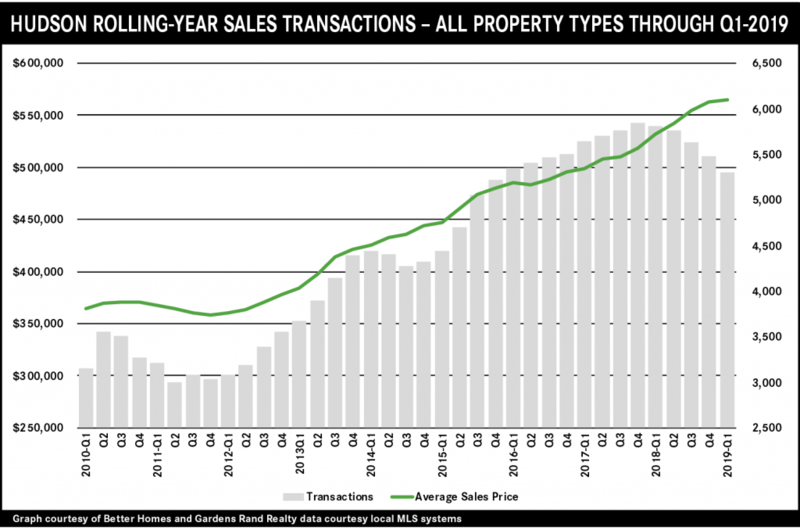 Accordingly, we expect a relatively robust spring market throughout the region. The housing market in Westchester and the Hudson Valley was a “tale of two markets” in the first quarter of 2019, with a sharp divergence between higher-priced and lower-priced counties. 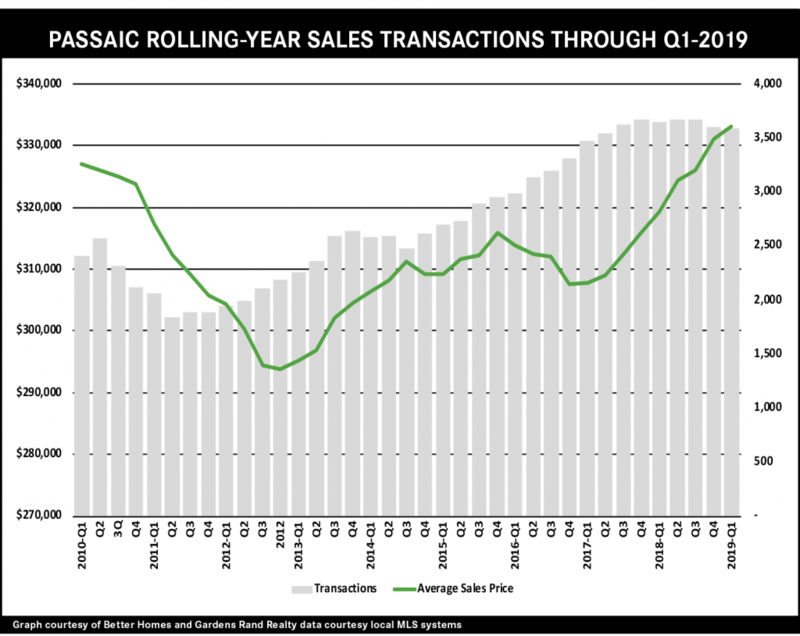 But we believe that the market is still poised for sales growth and price appreciation in what will be a relatively robust spring market. Regional sales were down, but the results varied by county and property type. Regional single-family sales fell about 3% for the quarter, but that cumulative number masked a real divergence in the county results. For example, sales were down almost 5% in Westchester, 5% in Putnam, and over 15% in Dutchess, but they were up 8% in Rockland and over 1% in Orange. Results in the condo markets were also mixed, with sales falling in Westchester, Putnam, and Rockland, but up in Orange and Dutchess. Similarly, prices were up regionally, but results were much stronger in lower-priced markets. For the region, the average price of single-family homes was up almost 2% for the rolling year, even with a slight tick down compared to last year’s first quarter. But, again, those cumulative regional results do not really tell the story, since price appreciation varied dramatically by county. Just looking at the longer-term trend for the rolling year, average prices were down a tick for Westchester single-family homes, but up sharply in all the other Hudson Valley counties: rising almost 4% in Putnam, over 4% in Rockland, over 8% in Orange, and over 11% in Dutchess. Moreover, price appreciation was much stronger in the lower-priced condo markets throughout the region. Rolling year average prices were up over 2% for the region, and up in every individual condo market, rising almost 1% for Westchester (and almost 4% for Westchester coops), 10% for Putnam, 4% for Rockland, 11% for Orange, and 7% for Dutchess. Essentially, we are seeing a “tale of two markets,” with sales and price appreciation higher in lower-priced markets and property types. We believe this divergence has been caused by the 2018 Tax Reform’s cap on state and local tax deductions (“SALT Cap”). When the tax code implemented Tax Reform, we speculated that the SALT Cap might have a more significant impact on higher-end markets. Why? Because taxpayers in those markets are more likely to itemize their taxes and thereby feel the pinch of the $10,000 SALT Cap. But in the lower-priced markets, homeowners and buyers are more likely to be at income levels where they tend to take the standard deduction, meaning that the SALT Cap would have little effect on them. Essentially, the SALT Cap is suppressing sales and price appreciation in the higher-priced markets like single-family homes in Westchester, but having little or no impact on lower-priced markets – including single-family homes in the other counties and condos throughout the region. Indeed, we are seeing the same thing throughout the metropolitan region – in the Northern New Jersey suburbs, for example, prices were down in higher-priced markets like Hudson, Bergen, Morris, and Essex but up in lower-priced markets like Passaic and Sussex. 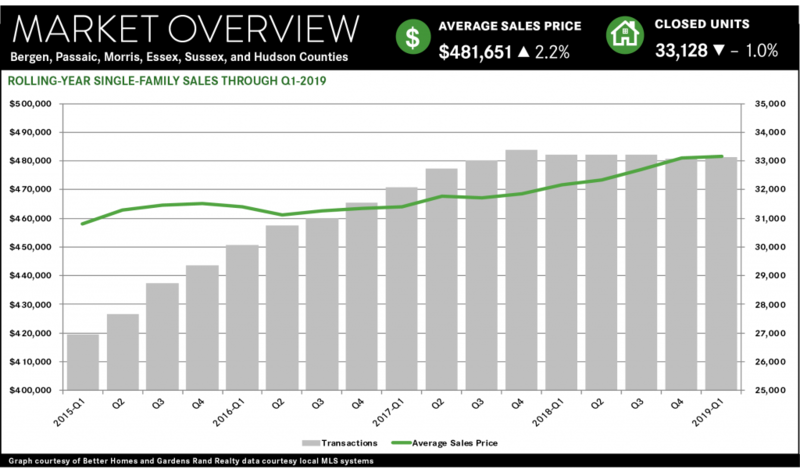 The SALT Cap is not devastating the high-end markets – for example, the rolling year average price in Westchester was basically flat – but it is hampering what would otherwise be a fairly robust seller’s market. Going forward, we still believe that the market is still poised for growth. At some point, we expect the impact of the SALT Cap to get priced into the market, because otherwise the seller market fundamentals are very strong: the economy is growing, interest rates are near historic lows, inventory is relatively low, and homes are still priced well below their highs. Accordingly, we expect a relatively robust spring market throughout the region. The Bergen County housing market coasted through the first quarter of 2019, with prices flat but sales up modestly. For the quarter, single-family sales rose almost 3%, but the average price was down just a tick. 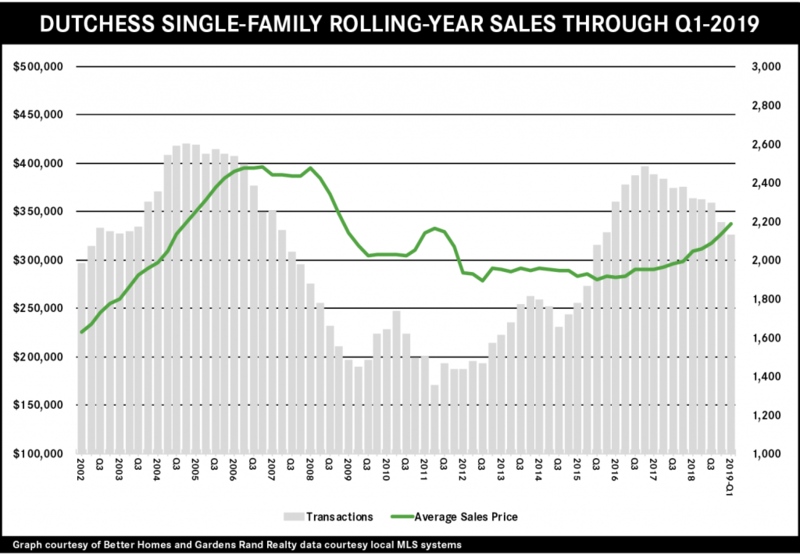 The single-family market has been slowly cruising along for the past year, with little sales growth and only about 1% of price appreciation, which is a little disappointing considering the market fundamentals. We might be seeing some impact from the 2018 Tax Reform’s $10,000 cap on state and local tax deductions (SALT Cap), which particularly affected higher-income taxpayers like Bergen County homeowners and home buyers, who are more likely to itemize their deductions and feel the pinch. We expected that the SALT Cap might have an impact on housing, and we’re certainly seeing that throughout the region in higher-priced markets like Bergen and its neighbors in Hudson, Morris, and Westchester County in New York. 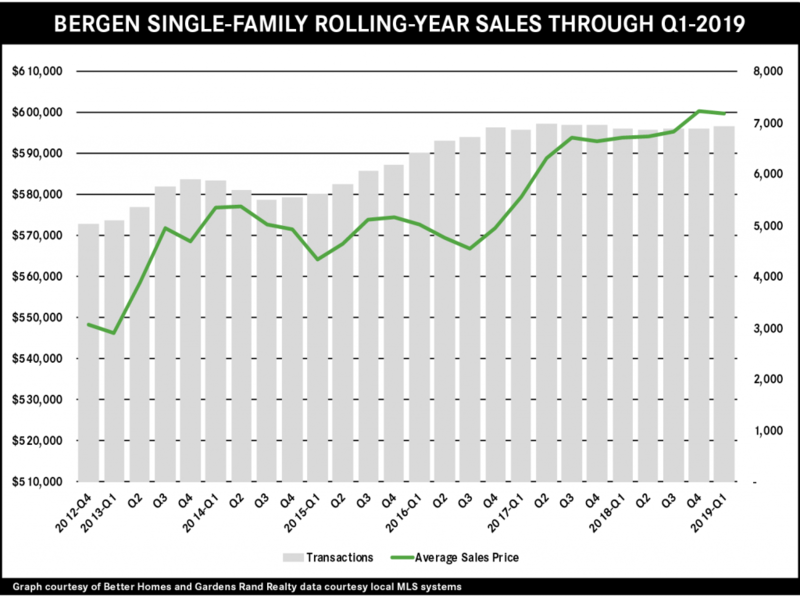 Indeed, that might explain why the Bergen condo market has been more robust, with rolling year sales up over 3% and prices up 7% — condo home buyers are more likely to claim the standard deduction, rather than itemize, so they’re not affected by the SALT Cap. Going forward, though, we expect that the SALT Cap’s impact will eventually get priced into the market, and believe that the seller market fundamentals are strong: a growing economy, prices well below historic highs, low interest rates, and low levels of inventory. 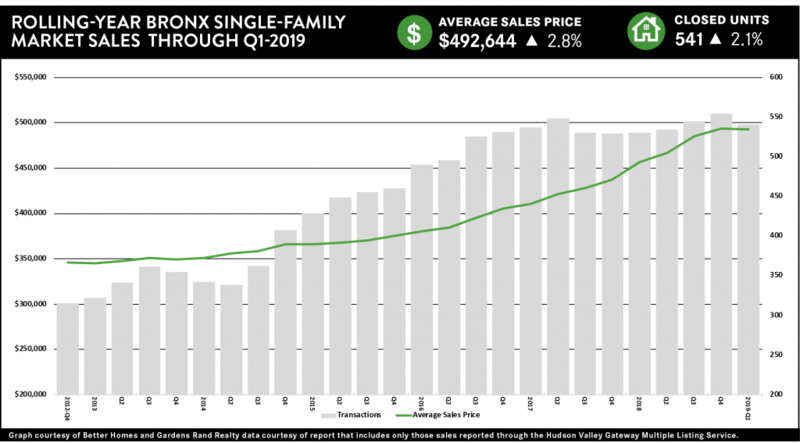 The Bronx housing market stumbled in the first quarter of 2019, slowing after torrid growth throughout most of 2018. Sales were down sharply for most property types, and prices were mixed. Going forward, we will be watching to see if this trend continues in the traditionally robust spring market, but believe that the fundamentals of the market are still very strong. Prices were mixed, depending on property type. The average price was up just a little more than 1% for the quarter overall, but that masked a real divergence based on property type, with condos and single-family homes down, but multi-family and coops up. 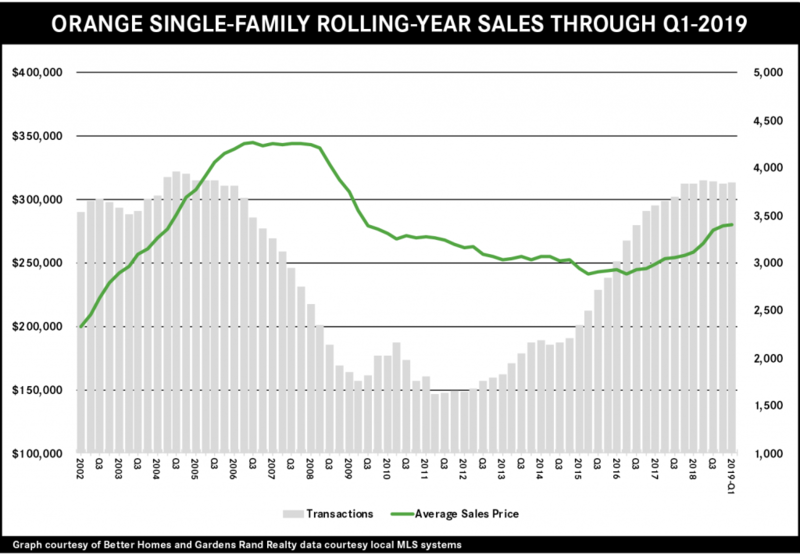 Even with the market slowing in the first quarter, though, the rolling year numbers were very strong, with the average price up almost 11% overall, and up in every property type: rising 3% for single-family homes, 10% for multi-family, 5% for coops, and 13% for condos. But sales were down in almost all property types. Overall, sales were down 11% compared to last year’s first quarter, falling for most property types: down 10% for single-family homes, 20% in multi-families, and 18% for condos. Quarterly sales were only up for coops, rising 4%. 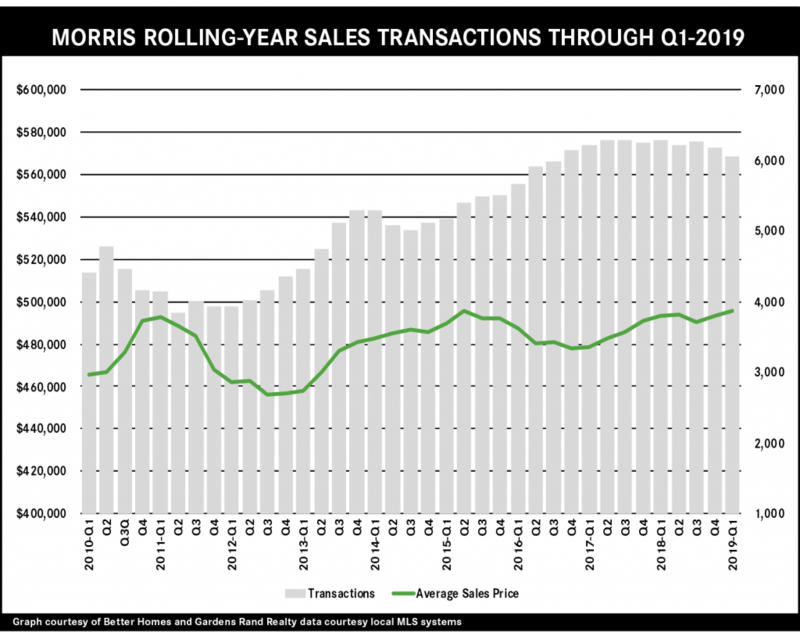 And now, for the first time in years, we’re seeing sales down for the full rolling year, dropping almost 4% overall. So why did the market slow in the first quarter? It might just be a short-term “breather” after the torrid pace over the past few years; the market has simply exploded over the past few years, and could not keep that up forever. Indeed, the Bronx might be feeling the effects of a much more severe slowdown in the Manhattan market, which is experiencing its first major correction in years. And we might also be seeing the impact of the 2018 Tax Reform cap on state and local tax deductions, which has had a modest but meaningful effect of suppressing sales growth and price appreciation in higher-end markets throughout the region. Going forward, though, we believe that Bronx sellers and homeowners have reason to be optimistic about where the market is going. The fundamentals are very strong: the economy is growing, inventory is still low, interest rates are near historic lows, and demand is high. We expect that, even with the challenges of the Manhattan slowdown and the tax cap, the Bronx market will grow in the traditionally robust spring market, with both sales growth and price appreciation. Pricing in the Dutchess housing market soared again in the first quarter, with single-family home prices spiking from high demand and limited inventory. Average prices were up almost 19% from the first quarter of last year, and over 11% for the rolling year. We caution readers, though, not to read too much into that data, because the quarterly average price was skewed by a number of large-acreage multi-million-dollar sales that are not representative of the average homeowner experience. That said, while Dutchess will probably not continue to experience double-digit appreciation, the county still has room for growth based on longer-term historical trends. The more significant anomaly was the severe drop in sales, which were down over 15% for the quarter and almost 8% for the year. We don’t believe that this is an indication of a slackening of demand, not with prices going up like they have, but more likely is simply a result of low levels of inventory. We expect that sales will rise in the traditionally more robust spring market, but we’re skeptical that prices will continue to rise at this rate. After sizzling throughout 2018, the Hudson County housing market slowed dramatically in the first quarter of 2019, with sales down sharply and price appreciation diminishing. Sales were down almost 15% overall from last year’s first quarter, and down for each property type. And pricing was relatively mixed compared to last year’s first quarter, with the average price down over 4% for single-family homes, up almost 6% for multi-families, and flat for condos. Now, prices are still way up for the year, rising over 6% overall and up in each property type, but the trend is a little concerning for Hudson homeowners and sellers. We might be seeing some impact from the 2018 Tax Reform’s $10,000 cap on state and local tax deductions (SALT Cap), which particularly affected higher-income taxpayers, who are more likely to itemize their deductions and feel the pinch. And we are certainly seeing some reverberations from the slowdown of the Manhattan market. Going forward, though, we expect that the SALT Cap’s impact will eventually get priced into the market, and believe that the seller market fundamentals are strong: a growing economy, low interest rates, and low levels of inventory. The Morris County housing market slowed down in the first quarter of 2019, with sales falling sharply. 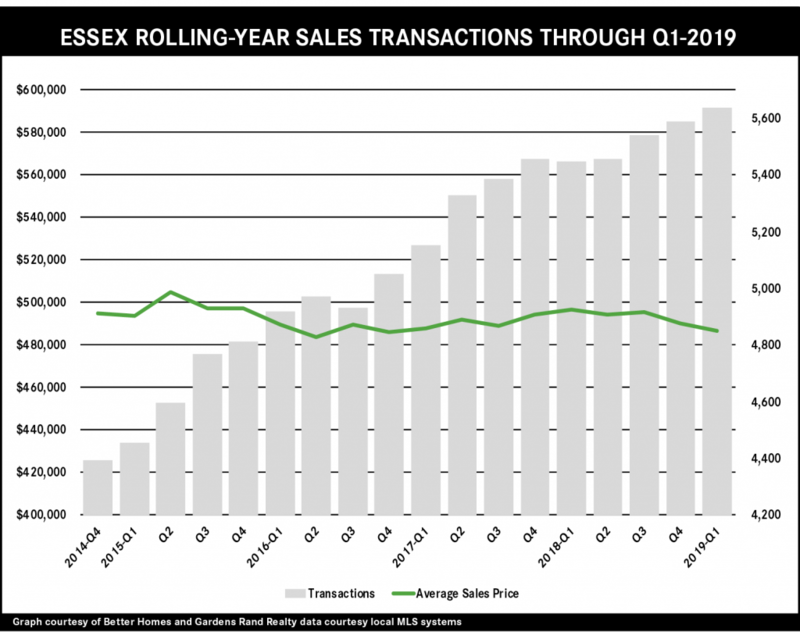 Transactions were down almost 12% from last year’s first quarter, finishing a rolling year in which they were down almost 4%. We still saw some modest price appreciation, with the average price rising about 2% for the quarter, but up only a tick for the rolling year. We might be seeing some impact from the 2018 Tax Reform’s $10,000 cap on state and local tax deductions (SALT Cap), which particularly affected higher-income taxpayers like Morris County homeowners and home buyers, who are more likely to itemize their deductions and feel the pinch. We expected that the SALT Cap might have an impact on housing, and we’re certainly seeing that throughout the region in markets like Morris and its high-priced neighboring counties like Bergen, Essex, Hudson, and Westchester County in New York. Going forward, though, we expect that the SALT Cap’s impact will eventually get priced into the market, and believe that the seller market fundamentals are strong: a growing economy, prices well below historic highs, low interest rates, and low levels of inventory. 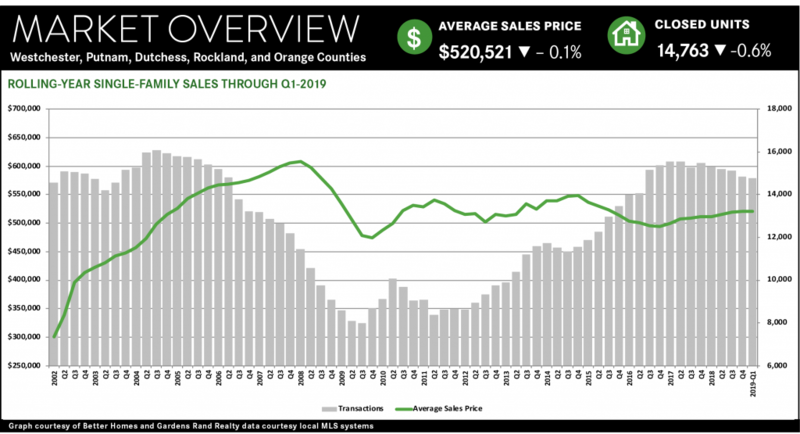 The Orange County housing market continued to grow in the first quarter of 2019, with both sales and prices up in what is now a thriving seller’s market. Low levels of single-family inventory continued to stifle sales growth, with sales only rising about 1% for the quarter and just a tick for the year. But demand remains high, evidenced by the almost 2% increase in the average sales price for the quarter, closing a rolling year in which Orange homes appreciated over 8%. Unlike the higher-priced markets in the region, Orange was unaffected by the 2018 Tax Reform cap on state and local tax deductions, perhaps because home buyers in the Orange price range are less likely to itemize their taxes. Indeed, if you look at the even lower-priced condo market, sales were up almost 31% and prices up over 6% for the quarter. Going forward, Orange home sellers have reason to be optimistic for the spring market, with prices at attractive levels, inventory below six months, and interest rates still near historic lows. The Passaic housing market continued to grow in the first quarter of 2019, with prices up again even while low levels of inventory constricted sales growth. We are seeing clear signs of a thriving seller’s market. Prices continue to go up, with the average price rising over 3% for the quarter and over 4% for the rolling year. And inventory is still falling, dropping almost 7% from last year’s first quarter and now down below the six-month level that usually signals a seller’s market. And that shortage of inventory is still suppressing sales growth, with sales falling a little for both the quarter and the rolling year. Going forward, we expect that sales will only go up when these rising prices tempt more homeowners into the market, and that we will continue to see price appreciation through a robust spring market. The market fundamentals are strong, with prices still below historic highs, interest rates low, and the economy thriving.